Enjoy a private yacht charter to Romantic Catalina. 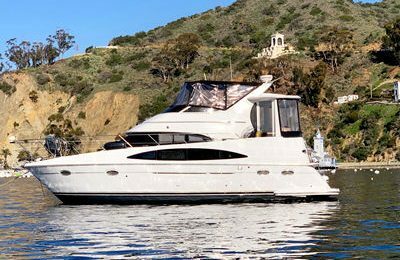 If you want a fancy yacht to enjoy the time on the way to Catalina, this 58′ luxurious express cruiser is a great choice. Take your family or best friends aboard this powerful, sleek looking, large size express cruiser, which comes with high end touches throughout. The cockpit entertainment space and salon area are extremely spacious.Experience world class performance and comfort along with a bottle of wine. 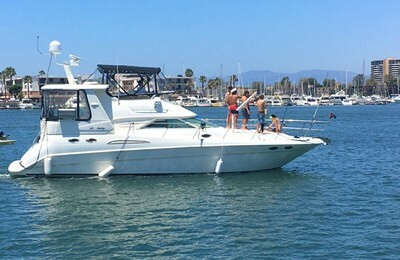 Cruise this luxury yacht in the beautiful harbor, then speed up across Santa Monica bay, Catalina island is less than 2 hours way. Picking up and drop off at King harbor, Redondo Beach. 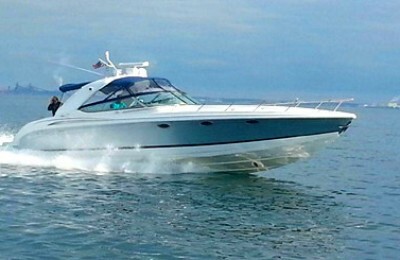 Yacht rental, captain service, port fees and complimentary snacks are all included in the price. Fuel cost is excluded, fuel cost due when check out according to actual usage.